A a very famous legend of love from the north Indian state of Rajasthan. 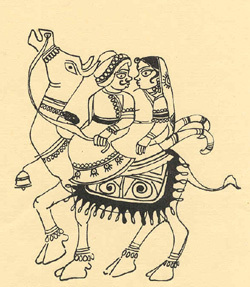 The ballad of Dhola and Maaru was composed in the 16th century by Kallol, a poet who lived during the reign of Raval Hariraja of Jaisalmer, in Dingal, the language used by the ancient bards of Rajasthan. Dhola Maaru is an inspiring tale that begins with the chance meeting of two Maharajahs at a religious festival in Pushkar. Immediately becoming friends, they invite each other to their palaces, which are several hundred miles apart. One of the Maharajahs has a very young son named Dhola, while the other has a daughter of the same age, Maaru. The two Maharajahs decide to bond their alliance with the marriage of Dhola and Maaru. The wedding takes place, and the two young children are married in grand fashion. Several years pass. Dhola, as he was too young at the time of the wedding to remember, is unaware of his marriage to Maaru. One day, Dhola's father gets a tempting marriage proposal for his son from a very rich Maharaja. Greed gets the better of him and he accepts the marriage offer. He makes sure that Dhola is never informed of his first marriage. 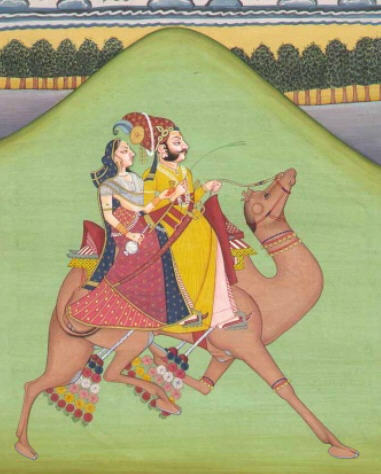 Dhola is married to Princess Maarvi and they live peacefully together in a large palace. One day, Princess Maarvi discovers the truth about her husband's childhood marriage and in an act of insecurity, she takes precautions to ensure that this information never reaches Dhola. She even disallows entry by any visitors from Maaru's town. Meanwhile, during "Gangaur Puja" (a ceremony during which unmarried girls ask for fulfillment of their wishes) Maaru prays for a kind husband. An old woman, who overhears her prayer, tells her that she has already been married to Prince Dhola for many years. Consumed by curiosity, Maaru sends out an official disguised as a musician to look for Dhola and tell him about her. The disguised official manages to find and reach Dhola and informs him about Maaru. Shocked at the truth, he decides to seek out Maaru, but Maarvi prevents him from leaving, afraid he will never return. Obsessed, Dhola loses his sleep and health. Concerned, Maarvi realizes that her husband may die and she finally allows him to go on the condition that he leaves only while she is asleep. Maarvi stays awake for seven days and nights, finally succumbing to exhaustion. Immediately, Dhola leaves to seek Maaru. Upon reaching Maaru's kingdom, he is given a warm and festive reception. Of course, Maaru is delighted with to find the unremembered bridegroom of her youth is both handsome and kind, and they are both very happy. But, Dhola remembers Maarvi's plight and decides to return to his kingdom, bringing Maaru with him. Overcome with joy, Maarvi welcomes them both and the kingdom rejoices with a colorful Holi celebration.